Born in Barnes, London to parents from the north. His father hailed from Lancashire, and his mother from Galashiels in the Scottish Borders. His father was a decorated WW1 veteran and successful engineer. Chadwick’s first names are in fact all surnames : ‘Lynn’ was his mother’s surname, and ‘Russell’ (his middle name) came from a common ancestor shared by both his parents. He had a younger sister, Majorie. He received a classical education at the Merchant Taylor’s School, which included Latin and Greek. The weekends included family visits to the London museums, and visits to Kew Gardens. During the 1930’s Chadwick, who aspired already to become a sculptor, worked as a draughtsman for various designers and architects in London. His work at that time was quite diverse. He even won a prize for textile design. 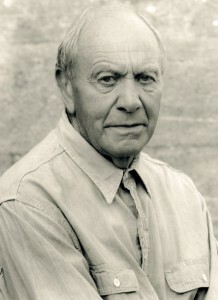 A turning point was his appointment to Rodney Thomas’s practice in London in 1937. He commenced architectural studies which he would never complete – the war intervened. He was mobilised relatively late – in the autumn of 1941 and became a pilot in the Fleet Air Arm. During training in Toronto he met Charlotte Ann Secord. They married and had a son, Simon, in 1942. In 1946 they moved to Gloucestershire, living in various cottages with no services, not even running water. He already knew Gloucestershire from childhood holidays. He also knew of the Whiteway Colony, not far from where he lived, founded by Tolstoian anarchists at the end of the 19th century; all his life he reserved a profound respect for their ideals of self-sufficiency and alternative way of life. The Fisheater 1951 Chadwick’s opus magnus. Built with the assistance of his eldest son, Simon, when the family lived at Pinswell, Upper Coberly. Donated by the artist to the Tate Britain in 1999. 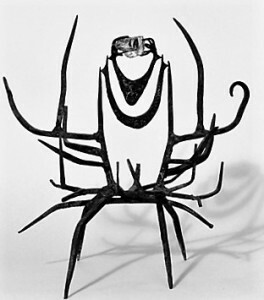 The period from 1947 to 1952 was an intensely creative period during which Chadwick established his reputation as a sculptor. 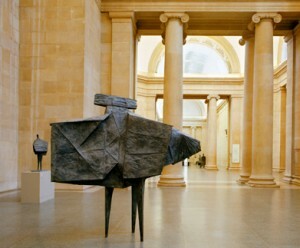 He was was rewarded with several prestigious commissions – two works for the Festival of Britain in 1951, and The Fisheater 1951 (right) for the Arts Council of Great Britain. While working with Rodney Thomas Chadwick had made several mobiles for exhibition stands, and now started to create mobiles as works of art. Some were suspended and others were placed on a base (‘stabiles’). He had his first one man exhibition at Gimpel Fils in June 1950. He enrolled for a welding course at the British Oxygen Company’s Welding School’s at Cricklewood and this permitted him to evolve technically. Concerning the formal appearance of his work at this time, it has been described as “linear” (Lawrence Alloway 1953). 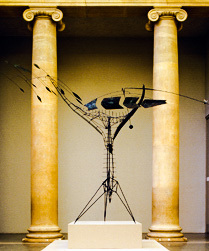 This definition captures the graphic nature of the welded rods, three dimensional drawings as it were. 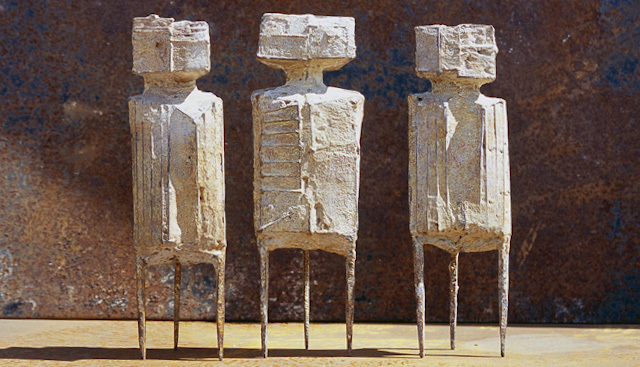 The dematerialised and angular nature of Chadwick’s work recalls earlier Modern sculpture in particularly The School of Paris and Russian Constructivism, though these were not direct sources of inspiration for him. A debate raged at the time, pitching “constructed” sculpture against “modeled” or “carved” sculpture. Chadwick et al were in the former camp. Henry Moore et al were in the latter camp. It was a bit like the media created opposition between the Beatles and the Rolling Stones. Technically speaking, he brought his own touch, a certain finesse and attention to details, no doubt resulting from years of draughting plans. His father, as mentioned above, was an engineer, and Chadwick often said that for him making sculpture was a matter of finding a solution to a problem. Another major work around this time was that of the “Inner Eye” 1952 in the Collection of the Museum of Modern Art, NY. He introduced pieces of glass, held in balance by metal claws pivoting on other arms (themselves sometimes pivoting between other supports). Several maquettes in the same theme survive, such as Untitled 1952 and Amber Spikey 1952 (both below). There is a naturalistic theme running through these early works, evoking insects or birds on the defensive. 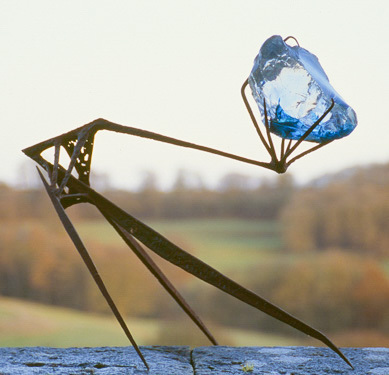 Incorporating a piece of glass, and naming the work “the Inner Eye” brings a different dimension to his work. In an interview for the British Library in 1995, asked about the idea behind the piece of glass, he replied that the idea came to him in a dream. A highly intuitive man, Chadwick was perfectly aligned with the post war Zeitgeist which along with others, he played a role in shaping the aesthetics of the 1950’s. 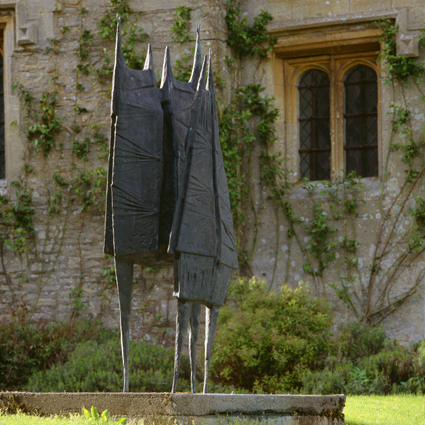 A formal overview of Chadwick’s sculpture in the 1950’s is rather like following the path of evolution in the animal kingdom. At the start we see mainly fish and insects, then reptiles, mammals and finally….mankind (perhaps the result of all those childhood visits to the Natural History museum in London). A wider public came in 1952 when Chadwick was invited by the British Council to contribute 4 sculptures and 4 drawings to the group exhibition in the British Pavilion at the Venice Biennale. The group of eight sculptors was not a movement as such, but there were some affinities between the participants. Referring to the works presented, Herbert Read saw an intuitive reaction to the horrors of war, and described the works as “the geometry of fear”, a term which became a catchphrase for several artists within the group. Invited again in 1956 to display 19 works at Venice, Chadwick was the surprise winner of the Sculpture Prize. He showed works from 1951 to 1956, including some recent dancing figures, such as Teddy Boy and Girl 1955 (right) and roaring beasts, evoking lions or dogs. Alan Bowness wrote of the works “Quite apart from the distinguished and highly original quality of his imagination, is the beauty and sensitivity of execution that impresses”. The works are less spindly than his first works. They display a mammalian strutting force. 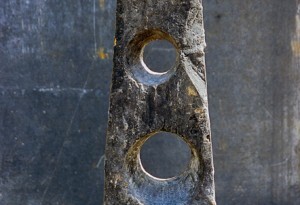 The lattice work of iron rods is still apparent, now fleshed out with ‘Stolit’, a compound of gypsum and iron powder. Chadwick was able to have bronze casts made of some of these works, more enduring than the original maquettes, or “working models” as he later called them. During the course of the 50’s his work becomes more figurative, with some affinities to César (Stranger series below). Friends with Kenneth Armitage since the 1952 Biennale, his figurative couples may have inspired Chadwick’s later works in a similar vein. In 1953, in between the two Venice Biennale exhibitions Chadwick participated in the Unknown Political Prisoner Competition, organised by the Institute of Contemporary Arts, London. He was awarded an honourable mention. He met with less success on the home front when his sculpture (Stranger III left) for Heathrow Airport was withdrawn. A maquette of the work had been selected in 1957, to commemorate the double crossing of the Atlantic by the airship R34. It was due to be placed at Heathrow in 1959. However the work, described by the aviator Lord Brabazon of Tara as a “diseased haddock”, was withdrawn by the Air League.